Advances in Energy Research Volume 5, Chapter 8. When electricity and heat are produced from a combined-heat-and-power (CHP) system or a co-generation system, the methodology for allocating the common cost to each product cost is very important because it is directly related to the profits and losses of the producer and the purchaser. There are various cost allocation methods. However, there is no correct answer, which is a fundamental problem in the field of cost allocation, and no methods can solve it clearly. In this chapter, the heat method, the work method, the benefit distribution method, the efficiency method, the equal method, the enthalpy method, the exergy method, the exergetic equal method, the exergetic work method, and the index method are discussed, and they are applied to a gas-turbine co-generation, a steam-turbine cogeneration, and a combined-cycle co-generation. Although these methods cannot solve the conflict between producers and purchasers in terms of profits and losses, they can help to determine the electricity cost and heat cost. Heat and electricity are supplied to houses, stores, buildings, and/orindustrial sites through a community energy system such as a combined-heat-and-power (CHP) system or co-generation system. One of the challenges associated with carrying out this service is that it is very difficult to determine how to allocate the costs of heat and electricity. There is no correct answer. Thus, the conflict between producers and purchasers in terms of profits and losses is inevitable. In co-generation, the fuel cost and the capital cost are inputted, and the electricity cost and the heat cost are outputted. 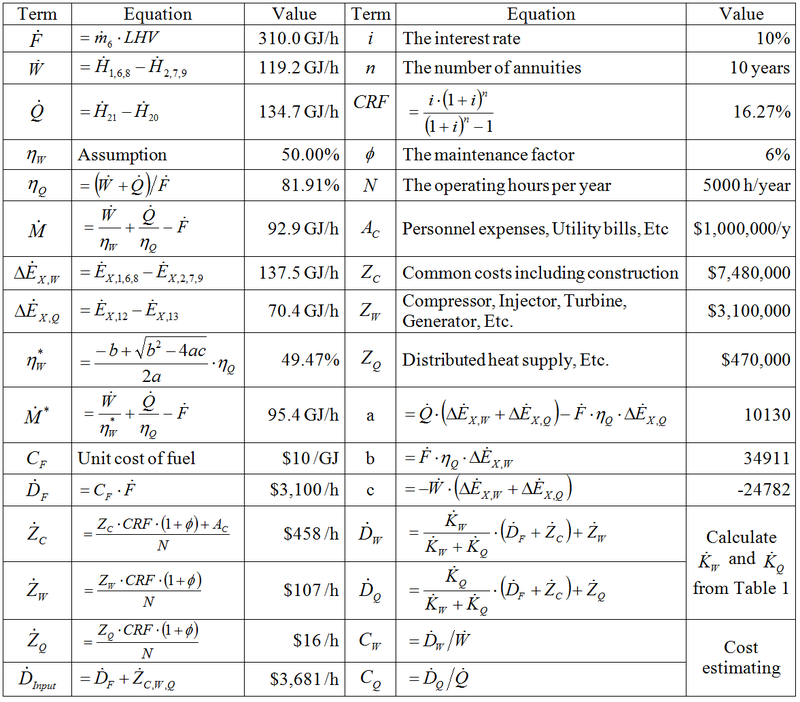 Assuming the sum of the fuel and capital costs is $100, what is the electricity cost (A) and the heat cost (B)? The equation is A+B=100, which cannot be solved exactly. Although there is no correct answer, we must solve the equation to sell or to buy each product. There are various methodologies to solve the equation. As introduced in a World Bank technical paper , there are various methods suggested in the field of accounting. The representative methods are the heat method, the work method, and the benefit distribution method. The advantage of these methods is that they are very simple. The disadvantage is that these methods analyze alternative systems such as a power plant and a heat-only boiler. Many thermal engineers in the field of thermoeconomics or exergoeconomics have suggested various exergetic methods, which are based on the second law of thermodynamics. The following representative methods were introduced in a review paper  on exergoeconomics: the theory of the exergetic cost (TEC) [3, 4], the theory of exergetic cost-disaggregating methodology (TECD) [3, 5], thermoeconomic functional analysis (TFA) [7, 8], intelligent functional approach (IFA) [9, 10], last-in-first-out principle (LIFO) , specific exergy costing/average cost approach (SPECO/AVCO) [12-15], modified productive structure analysis (MOPSA) [16-18], and engineering functional analysis (EFA) [19, 20]. The main feature of these methods is that they propose a cost balance equation that can be applied to each component of a thermal system. These equations are based on the exergy balance equation. Therefore, these methods can be reasonable from the view-point of thermal engineering. However, there is a disadvantage in that it is not easy to apply these methods to actual systems and solve thermoeconomic problems because too many equations are needed. We have suggested a wonergymethodology  that can analyze the cost allocation, cost optimization, and cost analysis for various thermal systems. The term “wonergy” is a new portmanteau of “worth” and “energy”, and the definition is an energy that can equally evaluate the energetic worth of each product. Here, worth is not an absolute number but a relative concept, which means that there is no correct answer in the wonergy methodology. 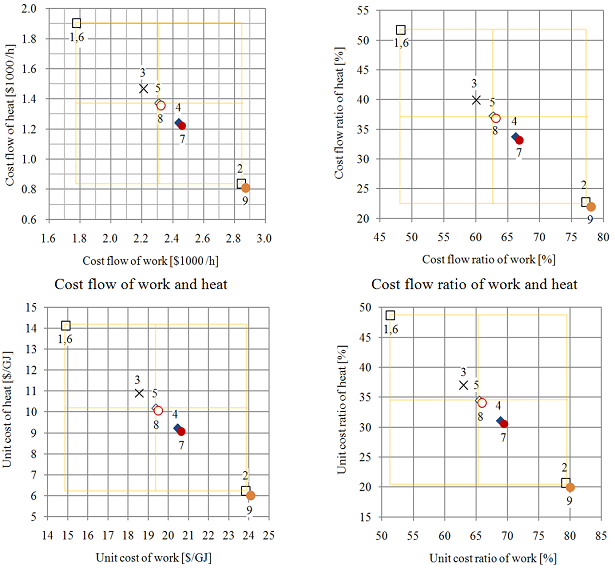 where is the fuel cost flow (including the environmental pollution cost) [$/h], is the common capital cost flow, is the electricity-only capital cost flow [$/h], is the heat-only capital cost flow [$/h], is the amount of wonergy input for work production [MJ/h], is theamount of wonergy input for heat production [MJ/h], is the work cost flow [$/h], and is the heat cost flow [$/h]. where the subscript F means fuel, HV means heating value, W means electricity-only components such as compressor, pump, and turbine, Q means heat-onlycomponents such as distributed heat supply, and C means common components such as combustion chamber, boiler, heater, pipes, etc. is the mass flow rate, Z is the initial purchase or construction cost ($), CRF is the annual capital recovery factor about 16%, i is the interest rate about 10%, n is the number of annuities about 10 years, is the maintenance factor about 6%, A is the annual cost ($/year) such as personnel expenses or utility bills, and N is the operating hours per year about 5000.
where is the amount of work output [MJ/h], is the amountof heat output [MJ/h], is the unitcost of work [$/MJ], and is the unitcost of heat [$/MJ]. In these equations, only and are independentvariables, whereas the other terms are given variables. Therefore, the key point in the wonergy methodology is to calculate the amount of wonergy inputs required for producing the work and the heat, that is, and . The components of co-generation canbe grouped with electricity-only components (compressor, pump, turbine, etc. ), heat-only components (distributed heat supply, etc. ), and common components (the others). As explained in a previous paper , the amount of wonergy inflow in commoncomponents is exactly equal to the summation of the amount of wonergy outflow in the electricity-onlycomponents and the amount of wonergy outflow in the heat-onlycomponents, as in Equation (10). where is equal to the sum of and . The heat efficiency of Equation (12) is the value of co-generation, but the work efficiency of Equation (11) is not the value of co-generation. Therefore, there is ambiguity in the work efficiency . All the methods introduced in this chapter are arranged in Table 1. The key point in the wonergy methodology is to calculate the amount of wonergy inputs required for producing the work and the heat, that is, and . From these values, the work cost and the heat cost can be allocated by Equations (1) and (2). The heat method applies the heat as wonergy. That is, this method evaluates each product based on the heat efficiency. Therefore, the heat of the fuel is , the heat for producing the heat is , and the heat for producing the work is the rest from Equation (10). This method distributes all the merit to the work. The work cost becomes always the minimum value and the heat cost becomes always the maximum value. Therefore, the results become the reference values. The work method applies the work as wonergy. That is, this method evaluates each product based on the work efficiency. Therefore, the work of the fuel is , the work for producing the work is , and the work for producingthe heat is the rest from Equation (10). This method distributes all the merit to the heat. The work cost becomes always themaximum value and the heat cost becomes the minimum value. Therefore, the results become the reference values. The benefit distribution method applies the individual fuel as wonergy. That is, this method evaluates each product based on the individual fuel inputted to a power plant and a heat-only-boiler. Therefore, the individual fuel for producing the work is and the individual fuel for producing the heat is . The reasonable cost must lie between the costs determined by the heat method and the work method. That is, a reasonable method must have a relation with the heat method and the work method. However, the result of the benefit distribution method has no relation with the results of the heat method and the work method. Therefore, we judge that the benefit distribution method is not reasonable. The efficiency method applies the fuel divided by efficiency as wonergy. That is, this method evaluates each product based on efficiency. Therefore, the fuel for producing work is , and the fuel for producing heat is . This method distributes the merit in proportion to the work efficiency and the heat efficiency . The result lies in proportion to the results of the heat method and the work method always. Assuming is zero in the term of the merit distribution, the results are equal to the heat method exactly. Assuming is zero in the term of the merit distribution, the results are equal to the work method exactly. Therefore, this method can be reasonable. The equal method applies the fuel divided by equal efficiency as wonergy. That is, this method evaluates each product based on equal efficiency. From the efficiency method, therefore, the fuel for producing work is and the fuel for producing heat is . This method distributes the merit equally. The result lies in the middle of the heat method and the work method always. However, must be larger than . Therefore, this method can be considered unreasonable from the view-point of thermodynamics. The precondition of co-generation is that there is a demand for electricity production. In general, the electricity produced in a co-generation system competes with the electricity produced from uranium or coal. Consequently, the time restriction can be inevitable in the co-generation system. In this case, the work cost should fall and the heat cost should rise. The equal method suggests the maximum limitation of the heat cost and the minimum limitation of the work cost, because is never smaller than . Therefore, in the case that a purchaser is requiredto buy the electricity of co-generation, this method may be reasonable from the view-point of economics. The enthalpy method applies the enthalpy as wonergy. That is, this method evaluates each product based on the enthalpy. Therefore, the enthalpy input for producing work is and the enthalpy input for producing heat is . In adiabatic conditions, is equal to and is equal to from the first law of thermoeconomics. The unit cost of work is always equal to the unit cost of heat because this method does not distinguish between work and heat. Also, the results are equal to the heat method exactly. Therefore, this method can be considered very unreasonable. The exergy method applies the exergy as wonergy. That is, this method evaluates each product based on the exergy. Therefore, the exergy input for producingwork is and the exergy input for producing heat is . The meaning of can be easily understood. The exergy method only applies the symbol to the symbol . Thus, the meaning of can be easily understood. In general, it is well-known that exergy evaluates the quality of energy the best. The result of this method is similar to the result of the efficiency method. Therefore, the exergy method can be reasonable. The work efficiency of Equation (11) is the value, not of the co-generation, but of a power plant. Therefore, the efficiency method using the work efficiency does not analyze the given state of cogeneration. The exergy method has no relation with Equation (11) or Equation (12), and it analyzes the given state of co-generation exactly. Therefore, the exergy method can be the most reasonable. Engineers can understand exergy, but economists may be unable to understand exergy. Therefore, we recommend the efficiency method to economists and the exergy method to engineers. The heat efficiency in Equation(12) is the value of co-generation. However, the work efficiency in Equation (11) is not the value of co-generation. Therefore, the new work efficiency of the co-generation needs to be calculated. This value can be found from the equation where the heat cost using the exergy method is equal to the heat cost using the efficiency method, Equation (2). The exergetic equal method applies the fuel divided by the exergetic equal efficiency as wonergy. That is, this method evaluates each product based on the exergetic equal efficiency. Therefore, the fuel for producing work is and the fuel for producing heat is . This method can be compared with the equal method, and the results are similar to each other. Therefore, the exergetic equal method can be reasonable from the view-point of economics. The equal method using Equation (11) is not to analyze the given state of co-generation. The exergetic equal method using Equation (16) analyzes the given state of co-generation exactly. Therefore, the exergetic equal method can be more reasonable than the equal method. The exergetic work method applies the work divided by exergetic efficiency as wonergy. That is, this method evaluates each product based on the exergetic work efficiency. Therefore, the work of the fuel is , the work for producing the work is , and the work for producing the heat is the rest from Equation (10). This method can be compared with the work method, and the results are similar to each other. The work method using Equation (11) does not analyze the given state of cogeneration. The exergetic work method using Equation (16) analyzes the given state of co-generation exactly. Therefore, the exergetic work method can be more reasonable than the work method. Finally, κ is an index equal to the ratio of unit cost in the common cost. The core of the index method is to determine the value of κ. Not only the energetic indexes of Table 1, but also a non-energetic index can be applied to κ. If the producer and the purchaser do not agree onany energetic methods, a third party (such as the government) may be required to determine each κ from non-energetic indexes. The heat method, the work method, the benefit distribution method, the efficiency method, and the equal method are accounting methods, and the enthalpy method, the exergy method, the exergetic equal method, and the exergetic work method are engineering methods. Here the result of the enthalpy method is exactly equal to the heat method, the result of the exergetic work method is similar to the work method, the result of the exergetic equal method is similar to the equal method, and the result of the exergy method is similar to the efficiency method. Therefore, we can know that the method approximating the engineering method is the accounting method. The benefit distribution method has no relationwith the other accounting methods and all the engineering methods. In general, it is well-known that this method is most fair. However, we judge that the benefit distribution method is not reasonable. In thermodynamics, the exergy of a system is the maximum useful work possible during a process that brings the system into equilibrium with a heat reservoir. When the surroundings are the reservoir, exergy is the potential of a system to cause a change as it achieves equilibrium with its environment. Exergy is the energy that is available to be used. After the system and surroundings reach equilibrium, the exergy is zero. Determining exergy is also the first goal of thermodynamics. Energy is never destroyed during a process; it changes from one form to another (see the first law of thermodynamics). In contrast, exergy accounts for the irreversibility of a process due to an increase in entropy (see the second law of thermodynamics). Exergy is always destroyed when a process involves a temperature change. This destruction is proportional to the entropy increase of the system together with its surroundings. The destroyed exergy has been called anergy. For an isothermal process, exergy and energy are interchangeable terms, and there is no anergy. Exergy analysis is performed in the field of industrial ecology to use energy more efficiently. The term was coined by Zoran Rant in 1956, but the concept was developed by J. Willard Gibbs in 1873. Ecologists and design engineers often choose a reference state for the reservoir that may be different from the actual surroundings of the system. Exergy is a combination property of a system and its environment because unlike energy, it depends on the state of both the system and environment. The exergy of a system in equilibrium with the environment is zero. Exergy is neither a thermodynamic property of matter nor a thermodynamic potential of a system. Exergy and energy both have units of joules. The internal energy of a system is always measured from a fixed reference state and is therefore, always a state function. Physical exergy : It is thefunction of the temperature and the pressure between the given state(T,P) and the ambient state(T0,P0). The physical exergy is used for analysis ofphysical processes. Chemical exergy : It is the function of the chemical composition between the given fluid( ) and the ambient fluid( ). The chemical exergy is used for analysis ofchemical processes. Kinetic exergy : It is thefunction of the given velocity from the zero velocity. Potential exergy : It is thefunction of the given location from the ground level. In general, the kinetic exergy and the potential exergy are much smaller than the physical exergy in thermal system. Therefore, these terms can be neglected. Applying the wonergy methodology to cogeneration, the inlet chemical exergy and the outlet chemical exergy eliminate each other in the equation. Therefore, there is no need to calculate the chemical exergy. where is mass flow rate, is specific enthalpy, is specific entropy, and the subscript means ambient state. To calculate the exergy of Equation (22), we should know the values of the specific enthalpy and specific entropy. These values can be found with commercial software or numerical programming. 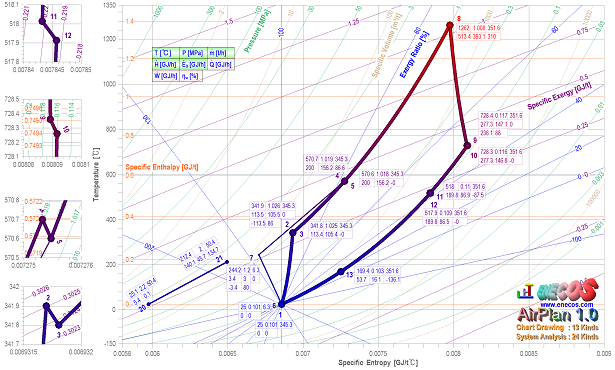 We have developed commercial software that can calculate the exergy and plot the line on a T-s chart. 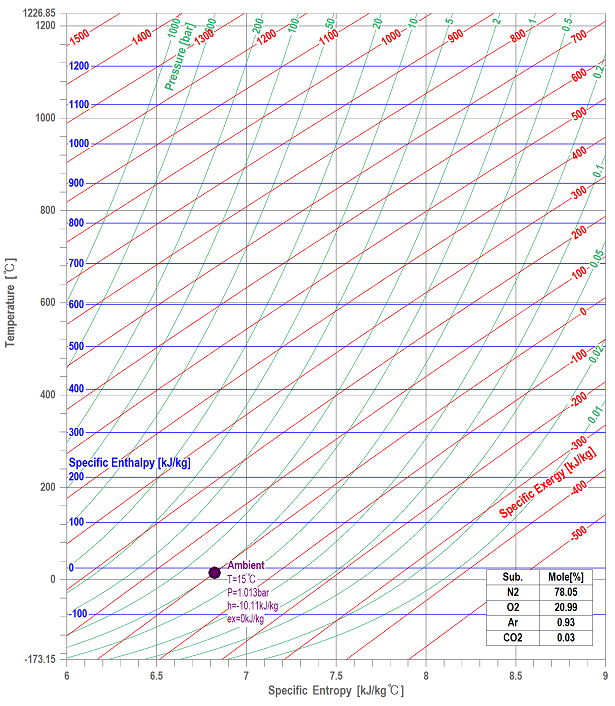 The specific exergy lines of air composed with various substances are plotted in Figure 1. The specific exergy lines of water and steam are plotted in Figure 2. Using these charts, system designers can understand the concept of exergy and confirm the values calculated from Equation (22). Figure 1. Specific exergy line of air. Figure 2. Specific exergy line of water and steam. A schematic diagram at the thermodynamic boundary and plant boundary of a co-generation system is illustrated in Figure 3. In general, cost allocation methodologies consider only the thermodynamic boundary such as Equations (1) and (2). However, there are additional energy flows, as shown in the plant boundary, and they should be considered in the cost allocation methodology. Figure 3. A schematic diagram on a co-generation system. The work output in the turbine is turned into electricity through the gear of efficiency and the generator of efficiency . Part of the electricity is supplied to thecondensing pump of , the circulating pump of , and the common components of . The heat output in heat exchanger is stored in the heat reservoir, and it is turned into heat through efficiency . Part of the heat is supplied to the common components of . Finally, the amount of electricity production is , and the amount of heat production is . In Figure 3, is , is , is , and is . The cost analysis is as follows. The electricity cost flow in the generator is equal to . The electricity cost flow inputted to the condensingpump is , which is an electricity-only cost. The electricity cost flowinputted to the heating pump is , which is a heat-only cost. The electricity cost flowinputted to the office is , which is a common cost. The heat cost flow in the heatreservoir is equal to . The heat cost flow inputted to the office is , which is a common cost. These cost flows should be reallocated. where the values of and can be calculated from Equations (1) and (2), and the terms of and can be calculated from Table 1. In general, the sale price of energy is composed of the usage price and the basic price. Similarly, the cost flow of Equations (27) and (28) can be divided into the usage cost and the basic cost. In Equations (1) and (2), the input costs are and . Assuming that is the usage cost, and in the fuel cost can be calculated by Equations (27) and (28). Assuming that is the basiccost, and in the capital cost can be calculated by Equations (27) and (28). In general, the fuel of heating an individual house is LNG. The unit cost of heat produced in co-generation is lower than that of LNG. Therefore, the heat of co-generation has competitiveness always. Electricity is produced from uranium, coil, LNG, etc. The unit cost of electricity produced in co-generation is lower than that of LNG but much higher than that of uranium. Although there is no heat reservoir, in the nation without nuclear power plant, co-generation may have competitiveness always because the electricity and heat can be produced and consumed simultaneously. However, if there are nuclear power plants, the production and the consumption of the electricity in co-generation do not occur simultaneously. In this case, the cost loss of electricity can be inevitable, and any cost allocation method cannot clear the conflict between the producers and the purchasers in terms of the profits and losses because the unit cost of electricity in cogeneration is very higher than that in nuclear power plant. Heat can be stored in a heat reservoir, but electricity cannot be stored. Therefore, to have competitiveness always, cogeneration should be operated when there is the demand of electricity, and the heat should be restored in a heat reservoir. where and are the amountof work and heat of the products, is the amountof heat input from a fuel or energy source, is the changein of the enthalpy flow rate at the stream that inputs the energy to another stream, is the changein the enthalpy flow rate at the stream that outputs the energy from another stream, and is the lostheat (heat loss) into the environment. In Equations (29) and (30), the heat product of the left side must be calculated as the difference between the outlet enthalpy and inlet enthalpy, and the other terms must be calculated as the difference between the inlet enthalpy and outlet enthalpy. where and are the amountof work and exergy of the products, is the amount of exergy input from a fuel or energy source, is the change in the exergy flow rate at the stream that inputs the exergy to another stream, is the change in the exergy flow rate at the stream that outputs the exergy from another stream, and is the lost exergy (exergy destruction or exergy loss). In Equations (31) and (32), the exergy product of the left side must be calculated as the difference between the outlet exergy and inlet exergy, and the other terms must be calculated between the difference of the inlet exergy and outlet exergy. where the wonergy products of the leftside must be calculated as the difference between the outlet wonergy and inlet wonergy, and the other terms must be calculated as the difference between the inlet wonergy and outlet wonergy. The wonergy is not a specific energy. It is just a word unifying the energies of various species. The concept of unification can be confirmed in the equations and tables in this chapter. Only co-generation at a steady state was considered in this chapter. If an unsteady state is considered in the energy system, the term of time is added in the energy and exergy balance equations. These equations also can be integrated into the wonergy balance equation. 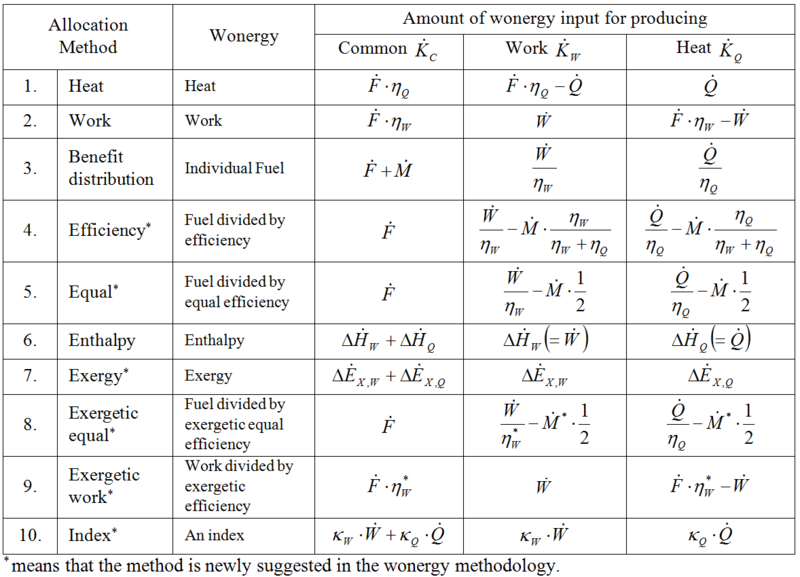 The wonergy can be extended into the non-thermodynamic energies such as Table 1. Therefore, if we understand the concept of wonergy, we can analyze the energy system and allocate the input costs more easily. The gas-turbine co-generation system in Figure 4 is composed of an air-compressor , a fuel injector , a combustion chamber , a gas-turbine , an air-preheater , a heat recovery steam generator(HRSG) , pipes , and the ambient atmosphere . The mole fractions of air, fuel, and combustion gas are shown in Figure 4, and the temperature, pressure, and mass flow rate of each state are given in the schematic diagram. The values of enthalpy and entropy can be calculated using commercial software or numerical programming, and the value of exergy can be calculated by Equation (22). We have developed commercial software that can calculate the properties and plot the lines on a T-s chart. 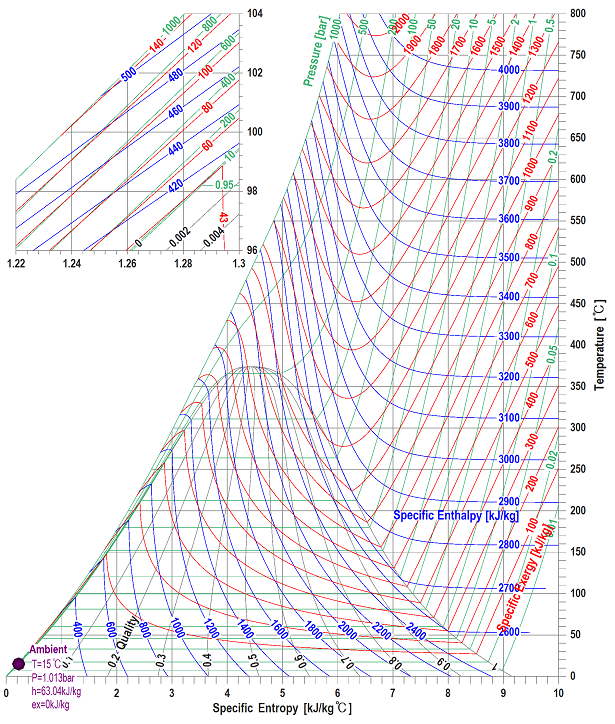 The mass flow rate, temperature, pressure, enthalpy, entropy, and exergy on each state are shown in Table 2, and the results, plotted on a T-s diagram, are illustrated in Figure 5. Figure 4. A heat balance diagram on a gas-turbine co-generation system. Figure 5. Operating state on the gas-turbine co-generation system. The results of Equations (29) and (30) are calculated in Table 3; the low heating value of fuel (LHV) is 49.202 GJ/t. According to this analysis, almost all of the energy loss occurs in the ambient. Therefore, we need to consider a plan for improving the ambient component. However, the 169.4℃ of state 13 is not useful. Therefore, it can be concluded that the analysis of the energy balance does not offer the desirable viewpoint. The results of Equations (31) and (32) are calculated in Table 4; the exergy of fuel is 49.151 GJ/t. According to this analysis, an amount of exergy loss occurs in the combustion chamber. By raising the adiabatic flame temperature, the exergy loss can fall off. However, the temperature cannot be raised because air pollutants such as nitrogen oxide are produced. The direction of improvement is as follows: 1) install an air compressor, a fuel injector, and a gas-turbine of high efficiency; 2) reduce the temperature difference in the air pre-heater; 3) increase the temperature of steam in the HRSG; and 4) install a heat exchanger at state 13 and produce hot water. If we can sell the hot water to a consumer, we will get additional profits. Similarly, the analysis of exergy balance gives a wealth of useful information to the system designer. The analysis and optimization of energy systems were discussed in a paper . All of the input data and equations for the cost allocation of the gas-turbine co-generation system are given in Table 5. Here, the analysis of energy balance and exergy balance are not needed. The fuel input is 310.0 GJ/h, and the work output is 119.2 GJ/h. Therefore, this efficiency is 38.46%. Installing a steam-turbine cycle at states 20 and 21, additional work can be obtained by replacing the steam heat. However, we do not know the amount of additional work exactly. We assume that the steam-turbine cycle can produce the work of efficiency 11.54%. Therefore, the work efficiency is 50.00 %. Because of this, all the methods except the exergetic methods can be considered unreasonable. In the cost allocation, the key point is to find the values of and . These values can be calculated by each term of Table1. Only the data of the thermodynamic boundary in Figure 3 is given in Figure 4. Therefore, the work cost and the heat cost can be found by Equations (1) and (2). The results of the cost allocation are shown in Table 6, and the charts are illustrated in Figure 6. We can confirm that the result of the heat method (1) is equal to the result of the enthalpy method (6), the result of the work method (2) is almost equal to the result of the exergetic work method (9), the result of the efficiency method (4) is almost equal to the result of the exergy method (7), and the result of the equal method (5) is almost equal to the result of the exergetic equal method (8). Figure 6. Cost allocation chart on the gas-turbine co-generation system. The results of the heat method (1) and the work method (2) are located at both endpoints, and the other results are located between them. We assumed the work efficiency . Therefore, there is some ambiguity in the results ofthe work method (2), the benefit distribution method (3), the efficiency method (4), and the equal method (5). The results of the exergy method (7), the exergetic equal method (8), and the exergetic work method (9) can be reasonable because there are no assumptions. The result of the equal method (5) is exactly located in the middle of the heat method (1) and the work method (2) results. 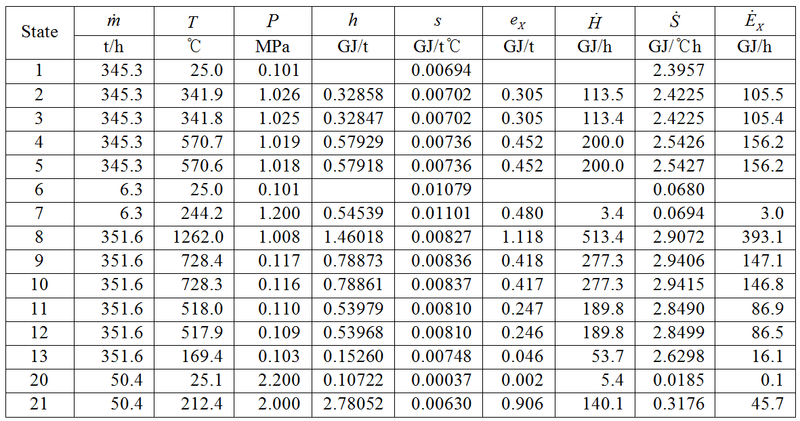 The equal method presupposes that the work efficiency is equal to the heat efficiency in the merit distribution of Table 1. The benefit distribution method (3) is located in the left-upper side, which means that the work efficiency is higher than the heat efficiency in the merit distribution of Table 1. Therefore, the result of the benefit distribution method can be considered unreasonable.